A Leamington building society reopened on Wednesday morning after a ram raid robbery last week. A robbery took place at the town branch of Coventry Building Society on the Parade on August 28 when four men in a silver Kia drove into the building, smashing through the glass frontage. The men then raided the bank, getting away with two ATM boxes of cash. The business and its cash machine remains closed with talks ongoing to reopen later in the week. A spokesperson from the company said: “We can confirm that there was an incident at our Parade branch in Leamington on Friday. “Only staff members were in the branch at the time, and no-one was hurt. Only staff members were in the branch at the time, and no-one was hurt. 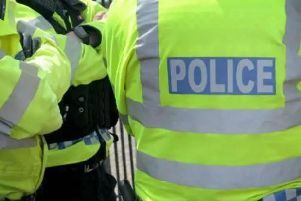 Police are still investigating the robbery, and have not confirmed how much cash is thought to have been taken, or if CCTV footage captured any of the offenders’ faces. Officers were called to the top of the Parade just after 8.30am where they found the silver Kia partly through the building and on the pavement. The car had mounted a deep step off the pavement and shattered a pane of glass on the building’s frontage after driving through the shutters in the raid. The men responsible are thought to have fled in a silver Vauxhall Astra which was found abandoned on Morrell Street later that morning. It is thought the four then got into a third car, a dark-grey saloon car and drove off. A police spokesperson said: “Police were called just after 8.30am to reports of a robbery at the Coventry Building Society on the Parade. “Officers arrived at the scene within three minutes and are still there making enquiries. The car was removed by late morning and specialists arrived at the scene to repair the glass. The top of Parade to Hamilton Terrace north bound was closed while the car was removed. Nobody was hurt in the incident but several staff members were inside the building when the car came through the window and were said to have been shaken up by the ordeal. Several workers and passers-by witnessed the raid, with many left in shock on the Parade through the morning as officers worked to secure the building and remove the abandoned Kia.